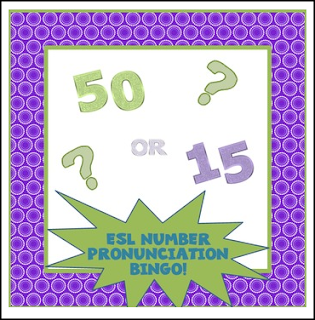 ESL Lesson: This short lesson will help English language learners notice the pronunciation difference between pairs of numbers such as fifteen and fifty. Students will then practice their speaking and listening skills to create a bingo card, and then they will have further listening practice as they play the game. All lesson instructions are included, as well as bingo cards and numbers and materials for game variation. If you download this product, your feedback would be greatly appreciated! Thanks! I ♥ followers! click the Follow Me link to get sale alerts, product updates and news about future products.